A bright stone cast into the Pool of Happiness! I've mentioned in my bio how much I loved getting craft books from the library when I was a child, and how I copied diagrams and instructions, but what I didn't mention was that I also started a book list of all the books I read, craft books, stories, everything, and, I had them all rated - 5 stars was the best, that meant it was a book I hoped to own some day! My love of books, information, and dreaming about having my own library started at a very early age. I also skimmed over the "drama and trauma" parts of my life in the bio, and I'm still going to, except to say - I lost all of those lists, drawings, journals, photos, etc. a long time ago. I really didn't remember many of the book titles, because I hadn't bothered to remember them, having written them down. Throughout the years I've fondly remembered a book here and there and, thanks to the internet, have been able to find some of them. There were a few extra special books like this one, that, although I had copied all the patterns and diagrams, I still loved and found myself checking out again and again. It was most definitely a five star book!!! That was a very long time ago though, and as an adult, it was one of the ones I couldn't remember the full title of. 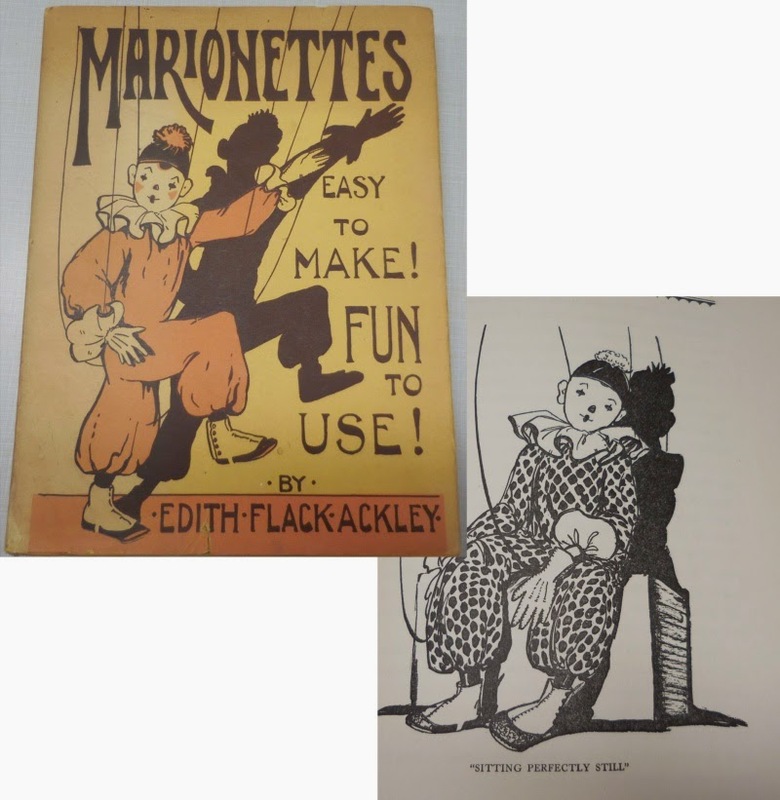 All I remembered was that the title was either "Marionettes" or had marionettes in the title....which, as you can imagine, includes just about every book written on the subject. Nonetheless, I've used that search term a few times, and bought some books that I thought were THE one, but not being able to view the entire book online, I have purchased the wrong one in each case. Not that I'm complaining, it's okay with me if I have a multitude of books on marionettes! Then one day, because of my purchase history (another bonus of buying the other books), a picture of this book came up. As soon as I saw it, I knew it was the one I used to read. Apparently, either there weren't any available the other times I had checked, or I didn't recognize it without the cover. I looked through the purchase choices and picked the hardcover that was in the best condition, etc., even though it only had 2 of the pattern pages in the back. Unfortunately, when the book arrived it was moldy. It was so moldy, in fact, that it made both Steve and I sick and we had to put it and all of it's packaging in the garage. I contacted the seller who was very sorry, and more than generous and agreeable in fixing the problem right away. But, I still didn't have the book. On the bright side, I now had all of the publishing information and knew what to look for, so put it on my list. Shortly after the first book problem, I found another hard copy with dust jacket, and all the patterns, in good condition! Hurray! Actually, I found a lot of copies of the book once I knew what to search for, but not all of them were in great shape; not surprising given that it is an old book (my copy is the eleventh printing of a book first published in 1929). I'm so happy to say that this one arrived in good condition and had been lovingly cared for. 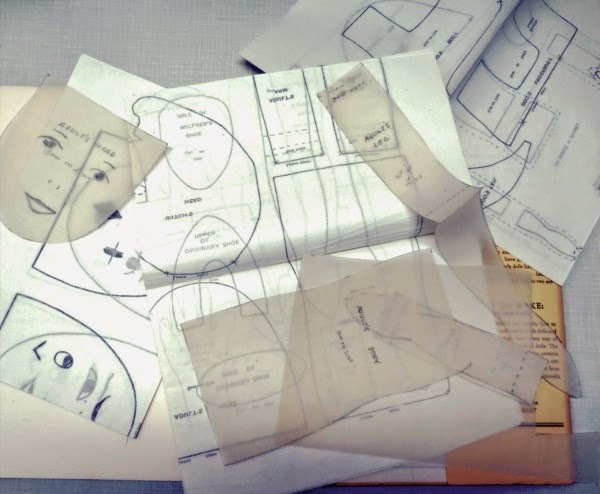 In fact, the person who owned it a long time ago had followed the author's advice in tracing the pattern pages onto separate pieces of paper in order to keep the original patterns intact, and those are tucked in to the pattern folder as well. The original book patterns are in pristine condition! I believe the previous owner loved the book as much as I did (do!). Book Joy! 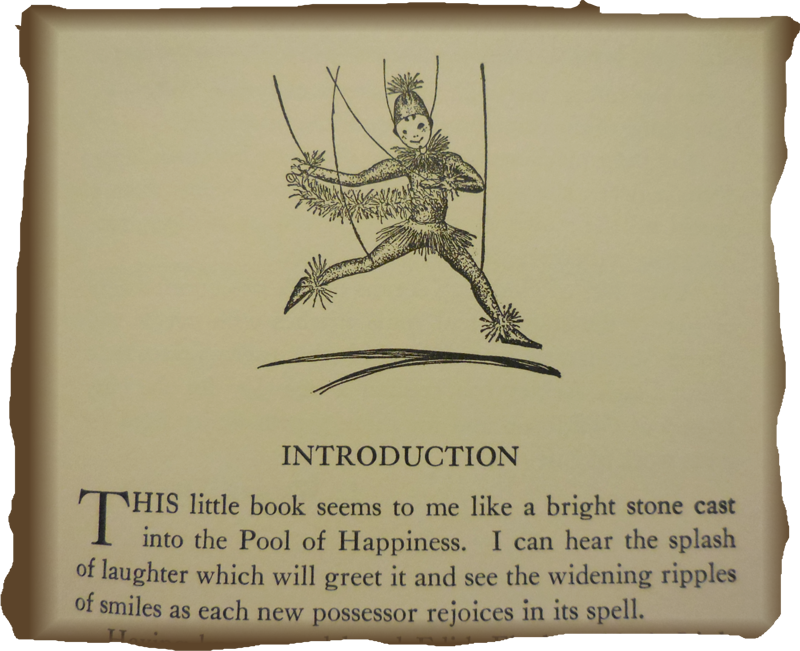 Every time I look at this book I smile.....and, as the introduction by L. Walker Erskine says, I "rejoice in its spell". Challenges and Inspirations -Why making tiny things is fun! 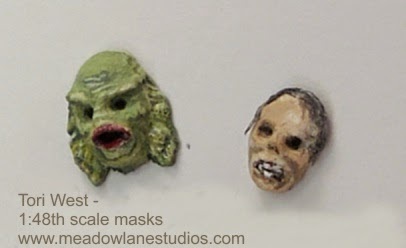 I recently decided to try making 1:48th and 1:24th scale mask forms, to offer them in kits, as I already do with my 1:12th scale form. Sculpting the forms themselves was a bit difficult, but in order to make sure they worked suitably I needed to make some masks. Creating those might not have been very difficult, until I decided to make it so. 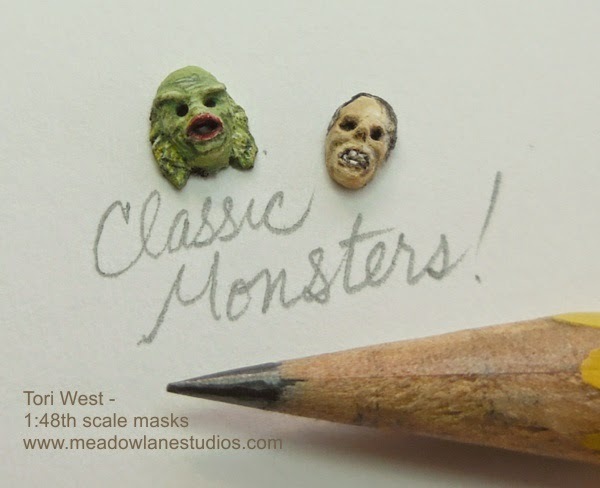 Also would have been easy enough to just make one simple mask on each, and it would have proven whether or not the forms were usable, but, I decided to re-create famous monsters. Why? 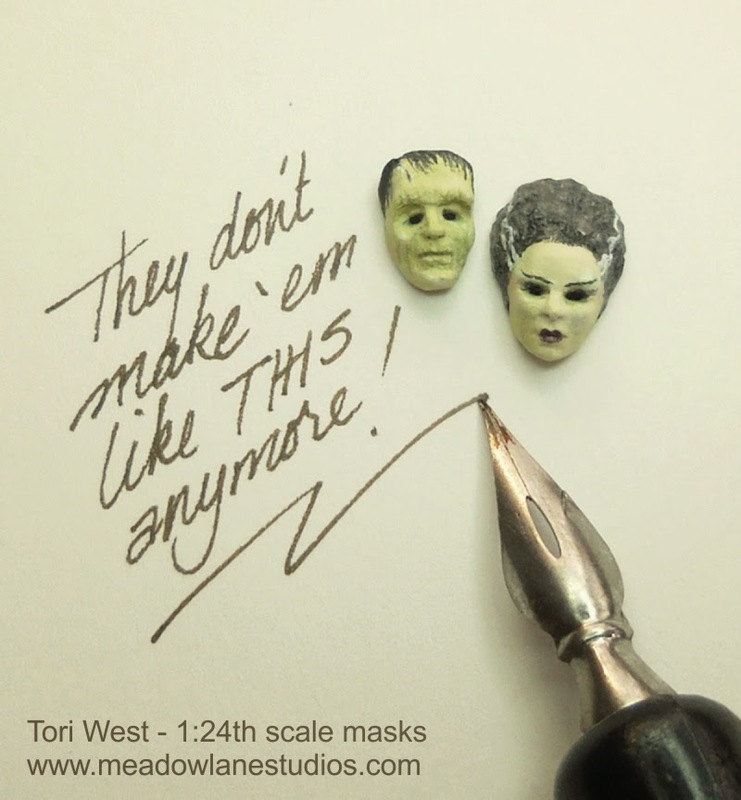 As I was dealing with the trials and frustrations of trying to accomplish these tiny things (the 1/48th scale masks are about 3/16ths of an inch long), I wondered why I always seem to want to make the things that are going to take so much time and effort. 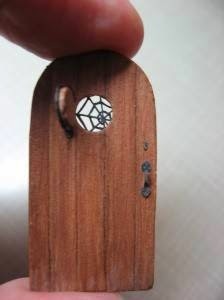 I've been asked before why I make miniatures, my standard "joke" answer is that "I love frustration". Considering that carefully though, perhaps it isn't a joke. Do I love frustration? Sort of. Or maybe it wouldn't be right to say I love it, but I do tend to thrive on it when it comes to creating art work; the fun part is the problem solving. 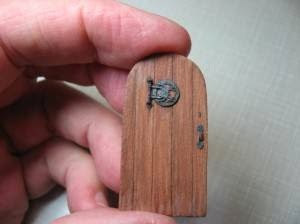 I look for things I've never seen in miniature before, and think "I wonder if I could make that?" "How would I do it?" I see things in "real life" size and think "That would be fun to make in miniature!". I do the same thing with other crafts, painting, drawing, etc. Of course I don't do this with everything, there are times when I want the comfort of a tried and true process that I've done "a million times", but even after all these years in the arts and craft world, I have never lost the thrill of trying something new or inventing a new method or technique, just to see if I can. THAT is the fun part! and now I'm going to change my answer as to why I come up with these things from "I love frustration" to "I love to learn!" While creating the masks I learned what will work, and what won't. I had to modify the method for smaller scales, and use some different materials. Over the last few weeks I've also been working on a 1:48th scale jointed human skeleton....and here again, I just this week invented a new way to make the pelvis and developed a pattern. Now next time I want to make a larger scale model, I'll have this new method and I'm just thrilled about it! the tree and house lights all work! 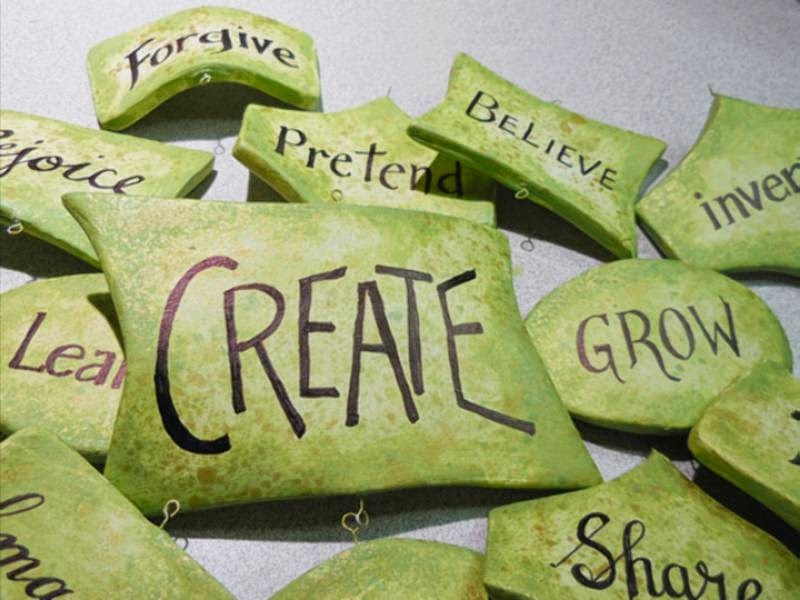 I tried to put the word pairs in a way that made sense to me - for instance, the word on the other side of "Create" is "Work" - so, both are things to do but also mean to create works of art. From my personal list I wasn't able to do all of the pairs that way, but it was fun to see how some of the words on it fit together. It would also be fun to try and make one where the word pairs did all go together in a message, interacting as you read the mobile from left to right. Maybe I'll try that one some day. I hope all of your plans, hopes, and dreams come true in 2015! 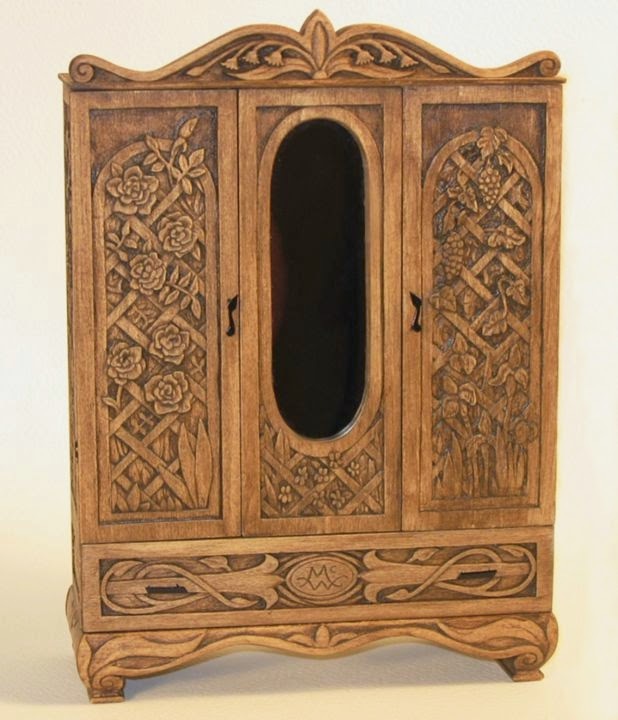 I actually began designing this wardrobe many years ago, then the project was put on hold by the client for a while, but finally we decided to go ahead with it. It has been a long time in the making! 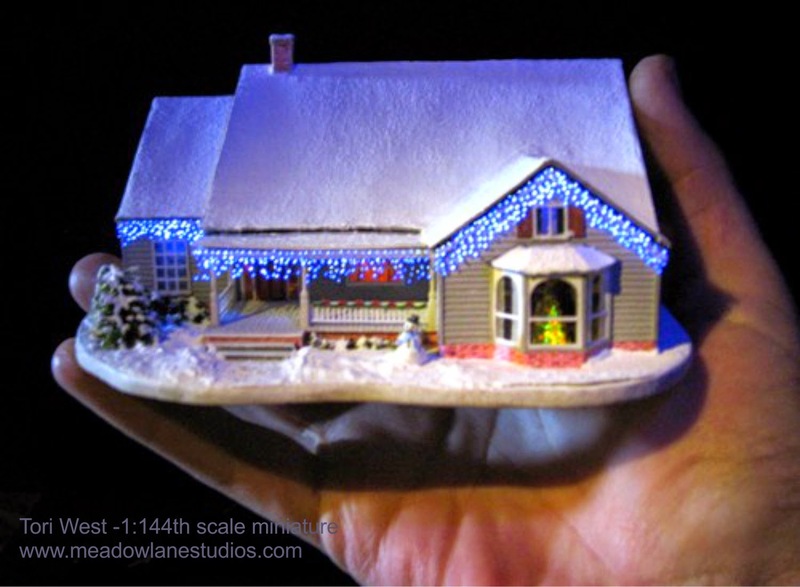 It is a 1:12 scale miniature – The finished piece is 6 1/2″ tall. the roses spill over to this side, and blend with angel trumpets. Six stars shine in the sky, one for each family member represented. and hay field under the moon. 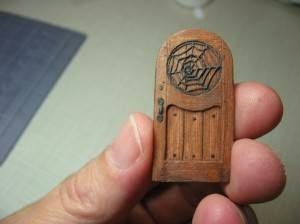 This is the first “installment” of sharing my work on a little witch house I’m making in quarter scale. 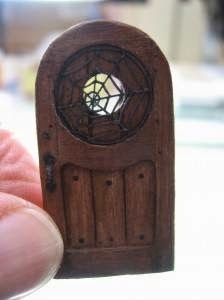 I’m not sure where or when I saw the first picture of this garden door, but as soon as I saw it I wanted to make one in miniature. 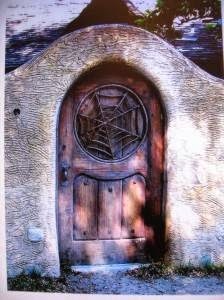 I also wanted to find out where the door was located, and discovered photos of the Spadena House in California, also known as the “Witch’s House”. Now I KNEW I need to make a miniature version. I researched and gathered as many photos as I could, then sketched out my basic floor plan and ideas for the house. The real house is quite large, and the house has a moat around it! 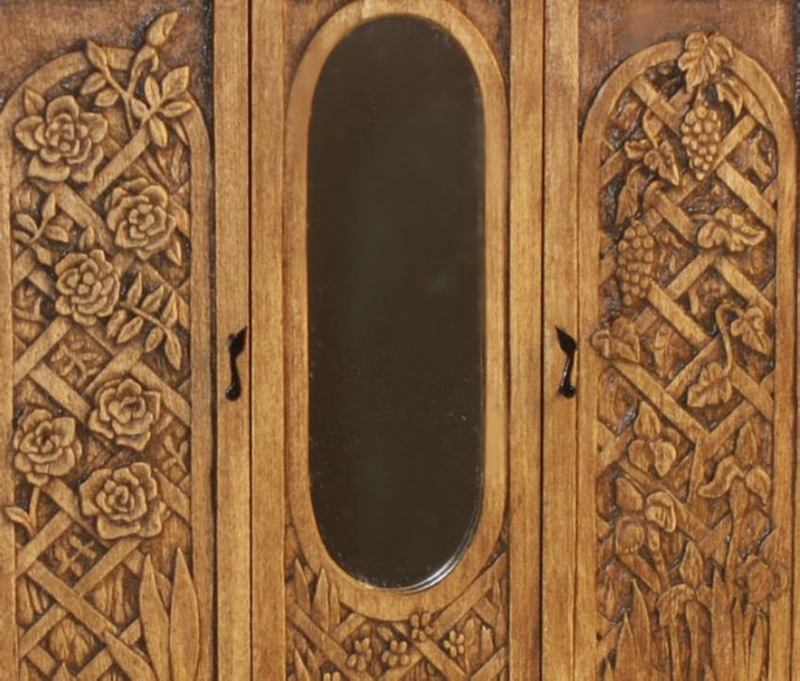 Even in a smaller scale this project could get to be quite large if I tried to make it closely resemble the real thing. I decided to make my version in quarter scale. Of course, I started with making the gate! Using my reference photos, I created a pattern in CorelDraw. I use this program for most of my design work, as well as for trying to create patterns for scale miniatures from photos of real life objects. It is a long process, but, once I've made a pattern I can use it for any scale. I didn't find any pictures of the back side of the gate, so I made up my own version for the portal. Yes, it opens, although the odds of me actually playing with it are slim, I just “had” to do it! 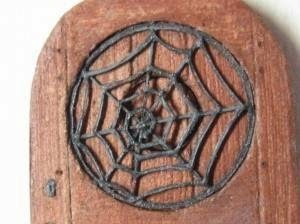 The reverse side - I decided a spider hinge would be the most appropriate type. I haven’t put hinges on the door yet. 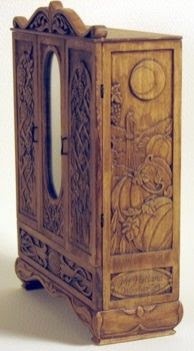 I’ll do that when I’m ready to install it, and also add another paint wash or two and a final glaze to tie it all together. I wanted to elevate the house and also have my model fit within the parameter of a standard picture frame. 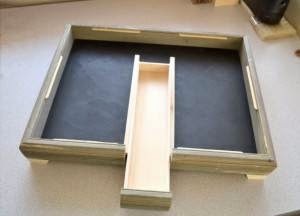 I had a 13″ X 17″ shadow box frame which had been on sale cheap! (probably because it was damaged and the corners weren’t mitered particularly well, but it will work just fine for my purposes). I cut a piece of hardboard to fit in place of the glass, and used craft sticks stuck in the channel where the glass used to fit, in order to support the hardboard. 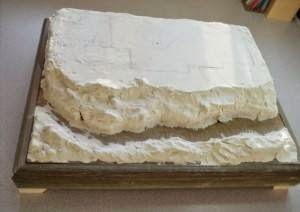 The next step was to cut an approx. 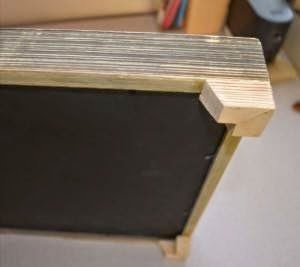 3″ section from one of the long sides of the frame, make a simple box drawer, and glue that to the section. 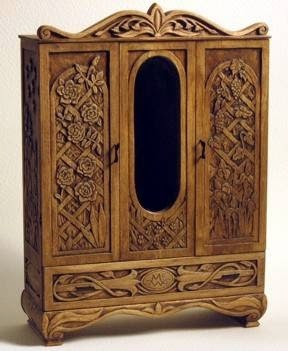 This will hold the wires and batteries, and maybe some seasonal decorating items should I decide to use them. 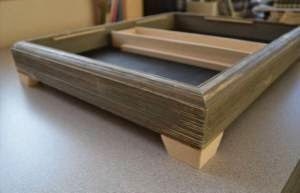 I also wanted to elevate the frame, so I cut and mitered some 1/2″ basswood strips, then used a carving tool and file to make the edges match the frame. I’ll paint it all later, when I’m ready for finishing the piece, since if I do it before then I’m likely to get it banged up during construction. 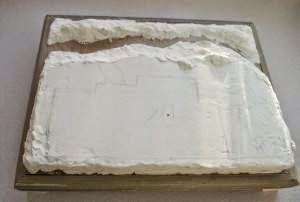 When I finished with the frame, I used foamcore scraps and roughly built up the area where I planned to put the house, then covered it with Creative Paperclay®. Since I want to use that gate, my layout includes the house, a small garden area, and a section in the front where I intend to put the bridge. Next time, I'll explain a new technique I developed for building the house! Exciting News for the New Year! It's official, I am now a member of the Creative Paperclay® modeling material design team! It's very exciting for me to be a part of this team, I've been admiring the work of the other artists on the blog for quite a while. I'll be posting at least one project and one tip on their blog every month for the next six months. 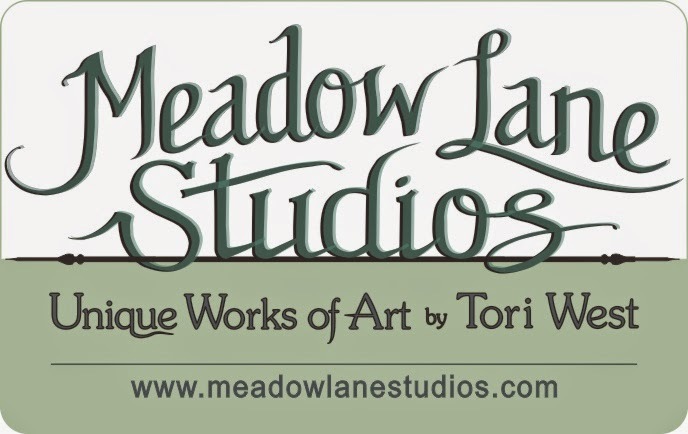 It's a chance for me to share and learn, and use the clay for more than miniatures. 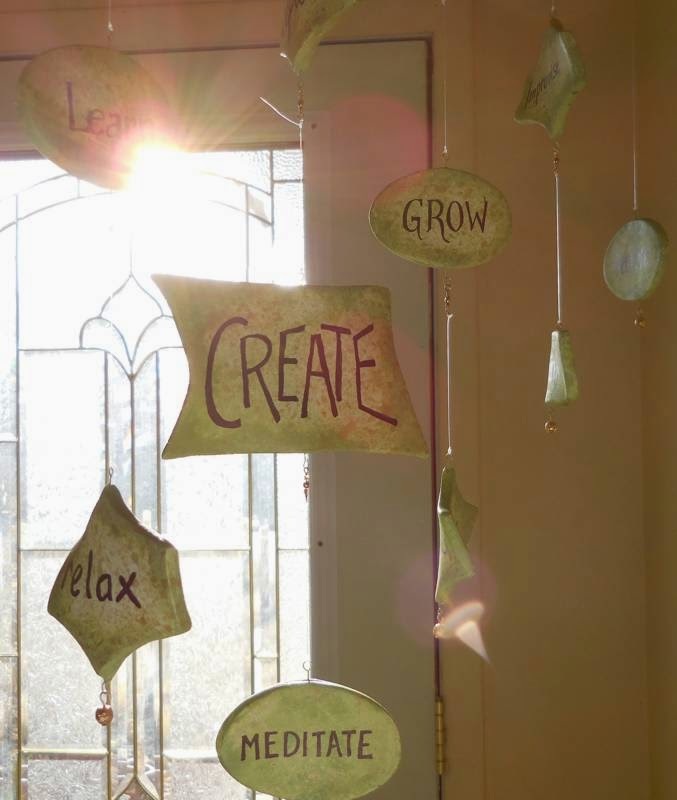 The project is an expression of my plans for the New Year - or, you could say that I resolve to do these things (share and learn are two of those things!). Hope your New Year is going just the way you want it to!